This is a page for odds and ends that don't quite belong anywhere else. It is a clearing house for new items, bits of news, and reader submissions. Here is a space for interesting photos sent in by visitors to the Gallery of Monster Toys! The following photos were submitted by an anonymous monster fan. This 30-something monster kid grew up during the original 60's "monster craze." His favorite toys are from that period, but he also appreciates resin kits and other modern items. Pictured above are such treasures as the complete set of boxed 60's Aurora models, Marx battery-operated and wind-up Frankensteins (they have their boxes, but you can't see them in the photo), and the set of Monster Soakies sitting in their original red cardboard bases. On the upper shelf are several horror busts and other display pieces. Here we have such goodies as a Universal City Studios wax Frankenstein in the upper left corner (these were made while you watched by an automated vending machine in the Universal theme park). 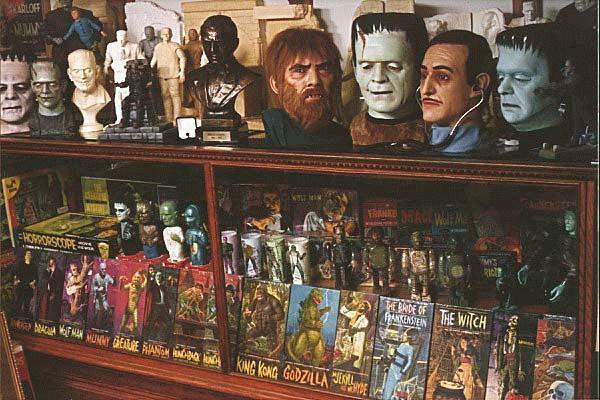 The coveted Universal Monsters lunch box sits to the right of the wax Frank, followed by a row of Aurora Monsters of the Movies model kit boxes. On the lower left stands my favorite piece in the collection, a 60's rubbery Frankenstein doll with "real" hair and cloth costume. His shoulders are jointed, and his shoes are made of metal. This doll was reportedly sold at carnivals, along with a similarly designed Witch. What a cool toy! 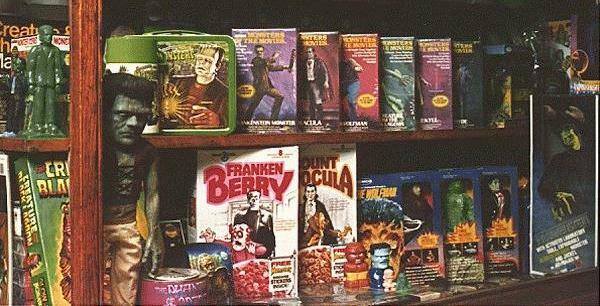 To the right of the Frank doll are a pair of General Mills cereal boxes, followed by some boxed Remco monsters. In the lower right corner sits a boxed Fun Stuf Frankenstein. Finally, we have this photo. 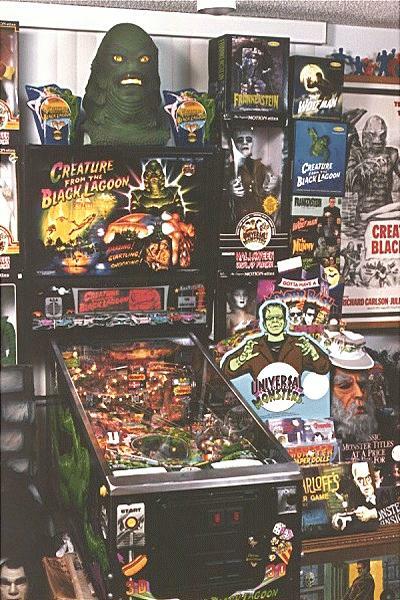 The centerpiece is obviously the Creature From The Black Lagoon pinball machine. Perched atop the machine is a latex Creature mask. Surrounding the machine are several boxed Telco Universal Monsters Motion-ettes. To the right are some boxed Dark Horse Universal Monsters cold-cast porcelain kits. Peeking out from beneath the Dark Horse Creature box are some Horizon vinyl kit boxes. In the upper right corner you can see a set of original Marx monster figurines. Below them is a Creature From The Black Lagoon movie poster. This is a 2-color one-sheet that was used for military bases. It's obvious that this monster fan is partial to the Creature. This would be more than enough for anyone's collection. But I only used half the photos he sent me! And he probably has twice as much that he didn't show me. What an impressive collection! -----------------------------58929460907791 Content-Disposition: form-data; name="userfile"; filename=""